Soccerlotto has been giving professional betting tips and advice for over ten years now (since 2001). The website is run by Perman one of the most successful tipsters in the U.K.
March 1981 Took over the Jack Boulder "Poolsmail" column in the Daily Mail from my father. I also inherited his job as "Forecaster" in the Morning Advertiser and three syndicated provincial newspaper columns. May 1982 Won the Mecca Bookmakers Individual Odds Trophy for professional tipsters by a record margin as "Jack Boulder" in my first season. May 1983 Retained the Mecca Trophy as "Forecaster" - yup: I enjoyed two bites at the cherry! But then so did two or three others amongst the 20-odd competitors. May 1985 Won Stockholm sports paper Vi Tippa tipping contest for UK National Papers giving tips for their equivalent of the Premier Ten bet. October 1986 Produced the First Edition of "Planning a Poolswin." Printed by a mate somewhere in the depths of the Oxford Mail offices, it was collated around the dining room table. It would eventually run to six editions all of which sold out. Altogether 40,000 copies were sold. The last edition was produced in 1993. In an Outlook review, Kevin Pullein called it "the best book on Pools ever written." February 1988 Started the Chiron Pools feature for ITV's Teletext (Chiron was the philosopher who guided Jason to the Golden Fleece). It became "Crossfire". Then along with the whole service, it became extinct. February 1989 Started the Soccer Betting Hotline which still continues today. I suspect it is the longest running telephone tipping service in the world. Its tips are now based on those supplied to SoccerLotto customers. May 1990 Won Vi Tippa prize again. August 1990 Published "From Beginner to Winner", a straightforward guide for newcomers to pools and plans. This ran through three editions all of which sold out. May 1992 Produced the first of a series of nine Aussie Soccer Annuals to help summer Pools punters. September 1992 Published "The Lot that Copped the Lot" - a detailed account of how every major pools win was achieved on all pools coupons over a three year period. September 1993 A group of Stoke taxi drivers wins £400,000 with a plan from "Planning a Poolswin". The following week, a Daventry factory group win £1,247,000 using another plan from "Planning a Poolswin." That is the biggest ever pair of wins in successive weeks by plans from one pools company or publication. The bigger hit plus another of £797,000 by a Brighton man who remains a current member of Soccerlotto are our two entries in the all-time Top Ten wins by Pools Plans. You can see Ruby Wax presenting the £1.2m cheque on our home page. March 1998 - commissioned to devise the Vernons postal coupon. January 1999 Became Figaro for the Racing and Football Outlook and signed up to the Richard Branson Virgin bid to take over the running of the National Lottery from Camelot. May 1999 Became Mathematician for the Racing and Football Outlook. May 2001 Soccerlotto.com launched. Our unique league tables highlighting the strength of opponents faced so far are still the only ones doing that on the net. They are unique in that our subscribers can choose the basis of the ordering, too. Our interactive analysis feature is also without parallel. September 2001 Commissioned to devise the Littlewoods Classic Value coupon. At this point, as I had already helped Brittens (now Jackpot) Pools re-launch their pools coupon, only Zetters of the four available coupons has escaped my clutches. May 2002. The Racing and Football Outlook's Figaro wins the Littlewoods Xperts Trophy for Draws Forecasting with my tips. A certain Jack Boulder of the Daily Mail finishes second... The Trophy is presented by World Cup winning goal keeper Gordon Banks - see photo. October 2004 Commissioned to devise and set up ClassicValuePools.com for Littlewoods Pools. This ran successfully for over a year until subsumed in a big revamp. 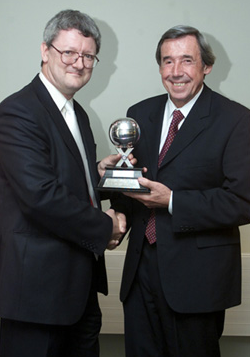 May 2005 Jack Boulder of the Daily Mail wins the Littlewoods Xperts Trophy for Draws Forecasting. May 2006 Jack Boulder becomes the first tipster to retain the Xperts Trophy for 30 years. February 2009 Soccerlotto.com launches its bankers and naps service. May 2011 Jack Boulder wins the Littlewoods Premier Ten forecasting competition with a record score. A certain Figaro of the Racing and Football Outlook finishes 2nd - and 2nd in the Xperts Trophy too.